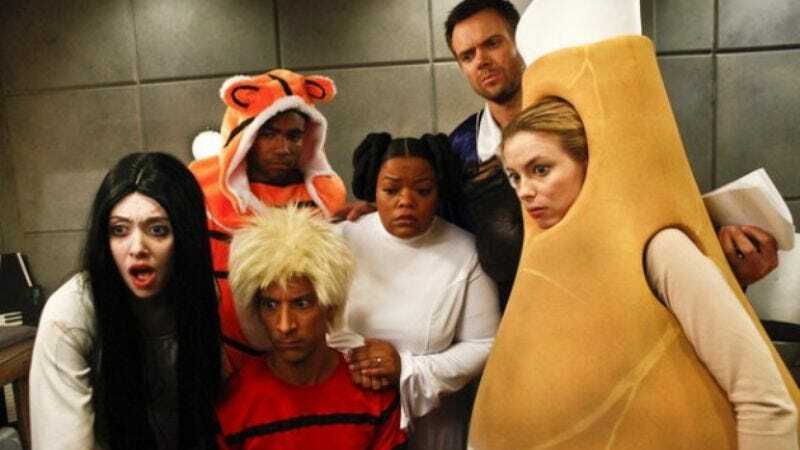 Much as Community’s fourth-season debut felt slightly different in both its tone and its unusually high ratings, last night’s episode—considered closer in spirit to the old, familiar Community by our own Todd VanDerWerff—similarly showed a return to form by getting abysmal ratings. “Paranormal Parentage” drew 2.7 million viewers and a 1.1 rating among adults 18 to 49—a 42-percent drop from last week that represents the series’ all-time worst showing in that demo. Of course, as we said when assessing the performance of the premiere, the surprisingly higher numbers last week could be attributed to rubbernecking newcomers lured by behind-the-scenes gossip, and they were unlikely to return anyway. As another caveat, Valentine’s Day is traditionally a terrible night for TV, with many audience members (for example, unmarried people) going through the motions of compulsory romance instead of watching sitcoms—and even those who were in front of their TVs may not have been in the mood to celebrate a belated Halloween. Still, for doomsayers forever looking for evidence that the post-Harmon era of the show will be a failure, this is certainly some delicious, ham-shaped grist for that mill—especially considering Parks And Recreation and The Office saw only relatively minor drops from last week. In non-Community yet equally dismal news, ABC has its lowest-ever in-season premiere of a scripted show with Zero Hour, its 6.3 million viewers and 1.3 rating representing a 41-percent drop from the debut of Last Resort in that same time slot. Again, some of that could be blamed on the overall 6-percent fall in ratings caused by Valentine’s Day, which saw even (comparatively minor) slides for stalwarts The Big Bang Theory, Two And A Half Men, and American Idol, as well as a series low for Grey’s Anatomy. But those who aren’t totally naïve know it’s actually a far more complex reason involving clocks and Nazis.